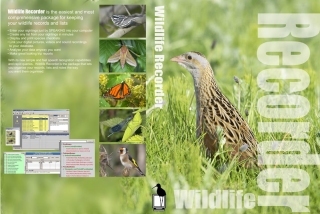 Wildlife Recorder is our comprehensive records and lists keeping package. Several versions are available to cater for beginners to professional users. Enter your sightings in minutes. Using the keyboard or advanced speech recognition. Automatically keep any number of life or year lists. Analyse your data anyway you want. Print your own Checklists for any part of the globe. Analyse your data using spreadsheets and charts. Seamlessly integrate with handheld computers (PDAs) to provide a complete system which can be used at home or in the field. Link to your digital photos, videos, sound clips and other media by using the Media Strip. Comes with a complete and up-to-date World Species database or optionally a local database (Western Palearctic or North American). The World version contains distribution information for all the countries of the World + states for large countries, 393 areas in total. Other databases available include World Mammals, European Butterflies, British Dragonflies, North American Butterflies, North American Dragonflies, British Moths and British vascular plants. Keeps comprehensive details about your sightings including unlimited free text notes. Wildlife Lister even has its own mini word processor to let you format your notes. Sightings can be entered either in trip form or using the bulk sightings entry facility which allows rapid entry in any sequence. Keeps details of all the geographic areas you have visited. The database provided contains all the countries of the World plus state names for larger countries. You may enter details of States, Counties and Sites. Sub-sites can be defined if required. Keep details of the observers who provided the sightings data. An unlimited number of lists can be kept automatically from the sightings you have entered. Any type of lists can be produced; country, state, county, site, faunal zone, ABA/AOU lists are all possible. Wildlife Recorder will automatically keep life lists and if required detailed year lists. Lists are automatically calculated from sightings data. and contain information about the species seen, first and last dates, early and late dates etc. Flexible Queries allow you can pull up a list of sightings for a site, county, country or any of the data you have entered, you can even search your free form notes. The Query designer allows you to design your own queries. Wildlife Lister is provided with a comprehensive set of reports to print checklists, trip reports, lists etc. Reports can be output to the printer, as a web page (HTML), an Adobe Acrobat document (PDF) or as a rich text file which can be edited using a word processor. A Report Designer is included so you can design your own reports. Allows you to produce your own checklists based the distribution areas provided with Wildlife Lister. Checklists can be can be output to the printer, as a web page (HTML), an Adobe Acrobat document (PDF) or as a rich text file which can be edited using a word processor. Allows you to easily link digital photographs, videos, sound clips and other media to species and your trips and sightings. Sightings and geographic information can be imported from other systems. Conversion packages available for Birder's Diary 2.5, AviSys and BirdBase. Bird Recorder 32 data can also be transferred if required. You can export you sightings data as a comma separated file in various formats including a suitable for for import into the eBird system. Full integration with Pocket Bird Recorder allows you to export species and site lists to a PDA running Pocket PC2000, 2002, Windows Mobile 2003, Windows Mobile 5 or Windows Mobile 6. On return from your trip the sites, trips and sightings are seamlessly imported into your Recorder database. Complete on-line help and tutorials. Integral backup and restore utility will compress and save your data to ensure you never lose it due to PC or other failures. Distribution mapping of sightings can be performed using the built in distribution mapping facility (professional version only) or by interfacing to the external DMAP program (not provided). Distribution mapping facilities. Your sightings can be plotted on Google Earth; your Google Earth plots can be shared with other people. You can search various sites on the Internet for information about species directly from the WR species checklist. Charting and graphing facility (professional version only). Wildlife Recorder is available in several versions, for diffreences between Wildlife Recorder Basic and Professional see. Recorder Basic and Professional comparison . Birds of the Western Palearctic and North America. British macro and micro moths. North American and European dragonflies. Mammals of the Western Palearctic and North America . · Microphone (optional, required to use speech recognition). Please see the Order form for current pricing. Last modified: Friday, 14th August 2015.